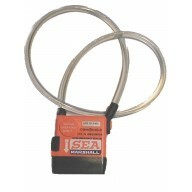 Emergency personal beacons (EPERB) are electronic devices that gives off a radio signal on the emergency band 121.5MHz. Used by divers that need emergency assistance or by those lost at sea, the radio signal is repeated every three seconds and can be tracked by every plane, helicopter within 50miles or boat within 10miles. 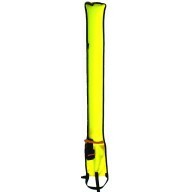 Armed manually, it can be worn on the person or be attached to a yellow surface marker buoy in a self contained unit. The market buoy option is supposed to provide 40% more efficient signal transmission due to aerial positioning. The average transmission period is 25 hours and it has a depth rating of 100metres. Make lost divers a thing of the past. This excellent bit of kit works by emitting a signal via the e..
An excellent accessory for the PLB 8 Epirb is the Epirb SMB. This SMB has been designed to house the..